I'll say is that FDR was in the White House when we both were born. In addition to good health we have a beautiful home, Riverhill, that has been in our family for generations, and we've had the funds necessary to keep it in good condition. We've also had the funds to continue the charitable work that has been a family legacy for over a century and a half. An'gel and I both love being involved in our community, Athena, Mississippi. We are blessed and happy, but I'll be honest with you -- at the moment, what I'm most thankful for is that the awful business caused by our old sorority sister, Rosabelle Sultan, is over and done with. Rosabelle was always one to bring trouble and confusion with her wherever she went, and this visit was no exception. It's a good thing neither An'gel nor I has ever been prone to heart trouble, because I know my blood pressure was higher than it's ever been, and An'gel's must have been, too. But it's done, now, and we can move on and look forward to the new year, when we go to visit our distant cousin, Mireille Champlain, over in Louisiana. That will be a nice break from the social round here in Athena. The Southern Ladies will return in October, 2015, in Dead with the Wind, when they discover that visiting family in Louisiana is not as trouble-free as they anticipated. What a coincidence! 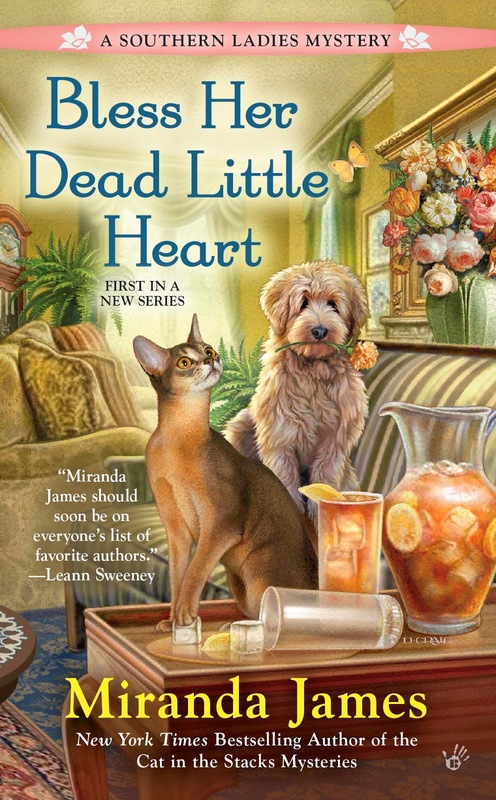 Bless her Dead Little Heart is the next book on my pile of books to read. I'm starting it today. Looking forward to reading this new series. These two sisters are a hoot and I can hardly wait to read DEAD WITH THE WIND next fall!! I'm happy to see my sister is thankful, especially this time of year. I am very thankful for that cute fireman who saved me when my head was bashed in with that craziness with our rude visitors. If "Dead With the Wind" is anything like "Bless Her Dead Little Heart" (and we know it will be), we're in for a treat! Thanks, Patricia! I'll do my best. I'm in the middle of Bless Her Dead Little Heart right now and really enjoying it. I'm not surprised....Charlie and Diesel are one of my favorite mystery duos, so it's great fun to be spending some time with Miss Dickce and Miss An'gel.